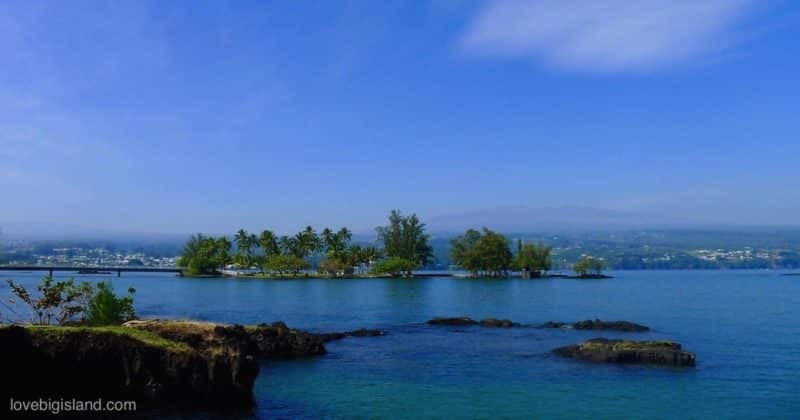 Hilo is the capital of the Big Island and lies on the windward (East) side of the Island. This is the rainy side on all Hawaiian islands and rainfall here averages 140 inches annually. 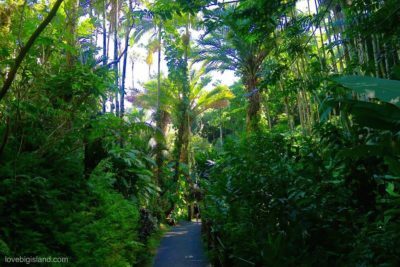 This makes the Hilo district tropical and lush, and fills the surrounding (rain)forests with colorful flowers and waterfalls. Hilo is not your typical tourist town but very easy to fall in love with. It is rainy and charming, tropical and laid back. People are friendly, and time here seems to run just a bit slower than on the Kona side of the island. Hilo is our favorite city on the Big Island. 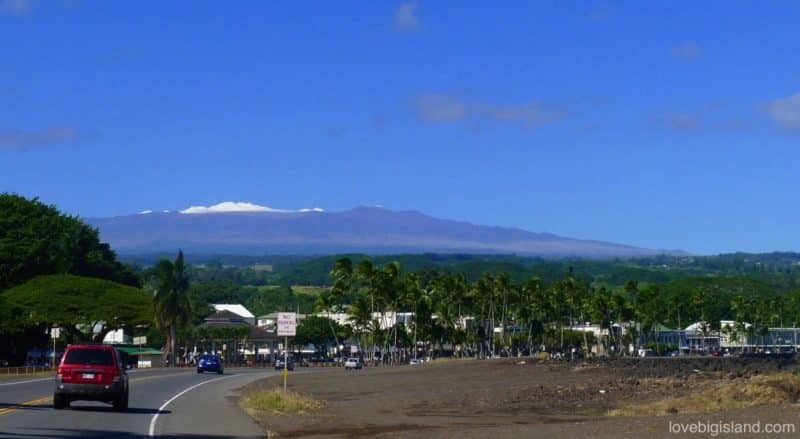 Hilo lies below the impressive Mauna Kea and Mauna Loa volcanoes. In winter these volcanoes are sometimes covered in snow. 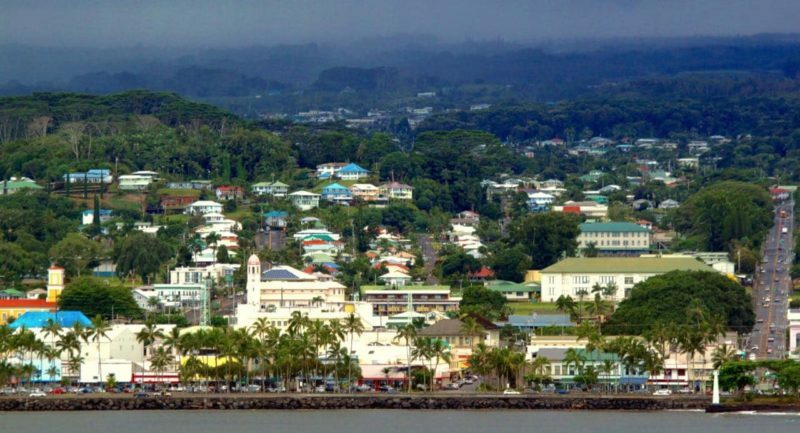 Next to being the Big Island capital Hilo also is the largest city on the island. With a population of almost 45.000 it is 3.3 times as big as Kailua Kona and is home to more than 23% of all residents of the island of Hawai’i. Hilo is home the University of Hawaii Hilo campus whose students and staff form about 10% of all of Hilo’s inhabitants. 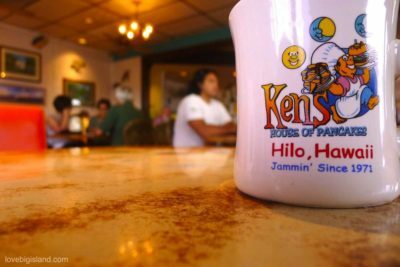 This gives parts of Hilo the vibe of a college town, with its own special atmosphere. Hilo also is considered the Cultural capital of the island. Historic buildings, two recent tsunami’s, and a heritage of the old plantations days set the scene. You’ll want to check the galleries and museums in downtown Hilo and don’t miss the farmers market that is opened every day of the week but whose BIG days are Wednesday and Saturday. Did you know that Hilo is the Orchid Capital of the world? The Lush climate on this side makes it the perfect place for cultivating orchids. If you look around you might see a few in the ‘wild’ yourself. 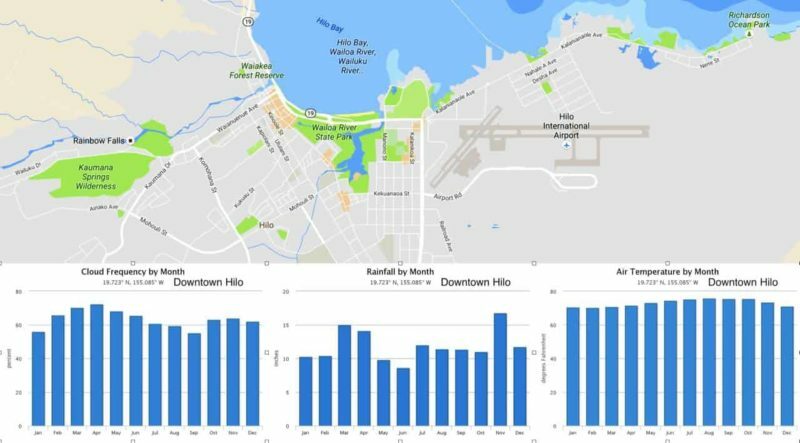 A good local resource about Hilo with often updated local events and information is downtownhilo. 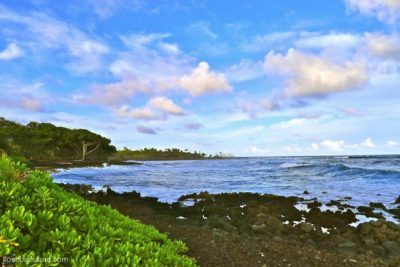 There are plenty of things to do in Hilo to spend a day or two. You can go see waterfalls, visit a few museums, check out the zoo, among other things. 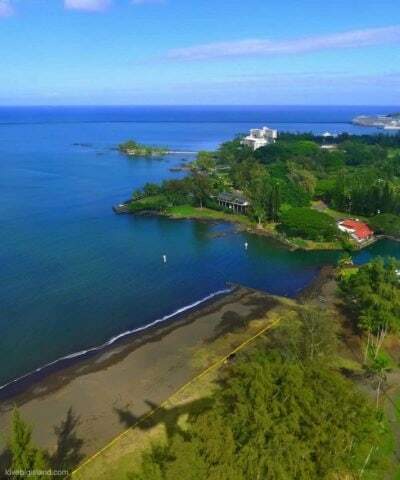 Read more information on our page dedicated to activities in Hilo. North of Hilo the lush Hāmākua coast stretches out, with many scenic routes, canyons, and waterfalls that can easily keep you mesmerized for the day. Closer by, there are many easily accessible spectacular waterfalls and lush rainforest trails to pick, of which the Rainbow Falls and “Boiling Pots” are the most famous. South of Hilo you can find the Puna district. This is the newest part of the island which is visible from the wild nature and high volcanic activity. In the middle of Puna you find the picturesque old hippie town of Pahoa. 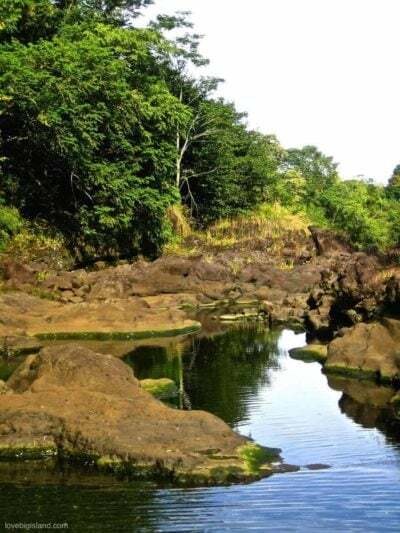 Plan a day in Puna to see a few extremely scenic drives between quaint beach parks, dip in hot ponds heated by the volcano, and see lava flowing into the sea (of course, only when the flow is active). Volcano Village and the Hawaii Volcanoes National Park are a 40 minute drive to the south-west away from Hilo. 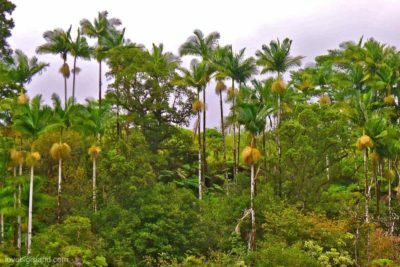 Both deserve an important role in your itinerary if you are interested in active volcanoes and some of the magical rainforest on the Big Island. Hilo is the landing place for many visitors to the Big Island through the Hilo International Airport. All the main rental car agencies have an office at the airport, but it is also possible to leave the airport by bus (hele-on bus). Kailua-Kona (86 miles, 2 hr 20 min), Waimea (55 miles, 1 hr 20 minutes), Pahoa (20 miles, 35 minutes) and Volcano Village (30 miles, 50 min) are all easily reachable by car. Hilo as seen from the ocean looking towards downtown. Adapted from original image by Prayitno on Flickr, published under a CC BY 2.0 license. With an average rainfall of 140 inches (!) annually a light raincoat is not a luxury. However, the rain here has the courtesy to wait mostly for the evening, and weeks without rainfall (during the day) are common. 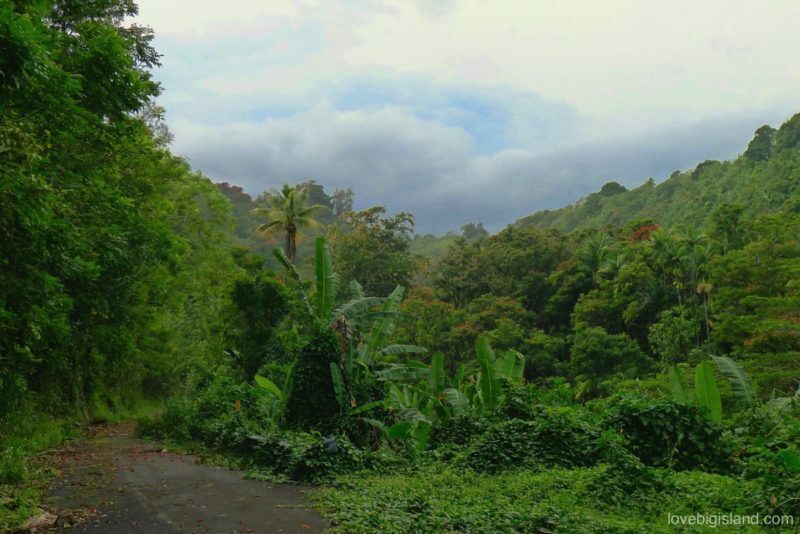 Because Hilo gets plenty of rain (mostly at night luckily), vegetation all around the area is lush and green! Hilo airport is in the middle of paradise! This is your view just before the plane lands: Coconut island, lush forest, and a beach! Boiling pots in Hilo gets its name from the many “boiling pots” eroded into the rocks by the water. Flash floods can happen, so be careful! Weather in Hilo is more humid and less sunny when compared to the rest of the Big Island but don’t worry to much about the weather: you are still in the so-called “tropical United States”! If you want to see what this means for your visit to Hawaii (average temperature, hours of sunshine, cloudy days and precipitation) check out the monthly average weather for Hilo. We have added what we think are the most important stops and activities in and around Hilo on an interactive map. 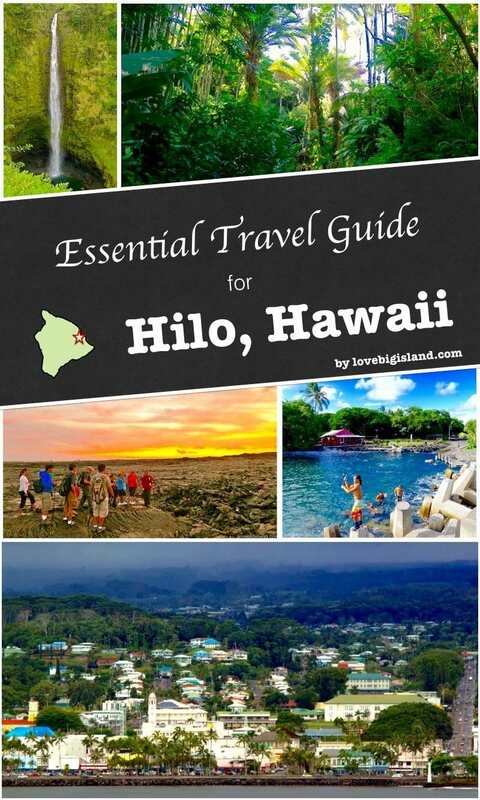 This map lists our highlights for Hilo and the Hamakua coast. Click any icon to find more information about that local activity, shop, or hotel/vacation rental.